WisDairy.com. The burger is America’s favorite food. Many people eat burgers daily, even twice daily (you know who you are!). 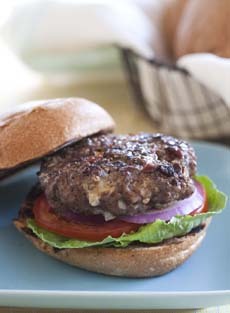 But a beefburger is filled with saturated fat—none more so than the “select” grade of beef used for many low- to moderately-priced burgers (plus chopped supermarket beef). What’s a health-loving, burger-loving person to do? See the comparison chart, which compares bison, beef, chicken, pork and sockeye salmon. What about the taste? Some say that beef tastes richer, because the fat level adds flavor. We think that bison, on the lean side, puts one’s taste buds closer to the richer, fuller flavor of the meat. Think the difference between superpremium ice cream and gelato. The proof is in the tasting, but one thing to clarify up-front is that (a) quality bison is not in any way gamy, but more tender/less fibrous and “sweeter” than beef; and (b) just like beef, there’s top grade and average quality. Check out our favorite, Blackwing Bison. It’s the best quality we’ve had. Treat yourself to some burgers. If you purchase bison at your local market and don’t love it, try another brand. One more thing: Because bison is so lean, it needs to be eaten on the rare side. For all of you well-done types: try it, you’ll like it.